Having been asked a few questions about stoves recently I’ve thought I’d post this piece. It first appeared in TGO last year and has been updated to take into account a couple of new stoves. One point not covered in the piece is lighting a stove. Some come with Piezo igniters – in my experience these break after a while. I’d never rely on just one type of lighter anyway. I always carry at least two – a fire steel and a lighter and/or matches. Paul Kirtley recently wrote a warning tale on this on his blog. Choosing a stove is as much about choosing the fuel as choosing a burner. The availability of fuel, how long a given amount lasts and how well it works in different conditions are all factors to take into consideration. For short trips in Britain the first and second factors may not matter but on long trips or if you're going abroad then being able to buy fuel is important (you can't fly with it or send it through the post). 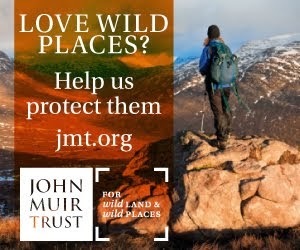 On my last two long distance walks, the Pacific Northwest Trail and the Scottish Watershed, I used a meths/alcohol stove because that was the only fuel I knew I would be able to buy in small towns along the way other than petrol/gasoline, which is harder to use and requires a much heavier stove. How well fuel performs becomes important in sub-zero conditions, especially for snow melting. The main fuels are butane/propane, white gas (Coleman Fuel and similar), and methylated spirits (meths)/alcohol. Less commonly used are petrol/gasoline, paraffin/kerosene, diesel, solid fuel and wood. Some stoves are multi-fuel, which can be a big advantage. The heat output from butane/propane, white gas, petrol and paraffin is similar but meths/alcohol is much less powerful so more fuel has to be carried. For travel to different countries it's useful to know the local names for different fuels, especially white gas and alcohol. This is a pretty comprehensive list. Stoves that run on butane/propane cartridges are very easy to use. They're clean too, with no liquid fuel to spill, and the smallest burners are very light and compact. There are two types of gas stove (so-called because the fuel is burnt as a gas though it's liquid when under pressure in the cartridge). Upright or piggyback stoves are ones where the stove screws directly into the cartridge. These are the lightest gas stoves and fine for use in above freezing conditions. They're also best used with small pots as they're not very stable with big ones. When the temperature drops below freezing these stoves can be slow as the fuel doesn't vaporise easily. In extreme cold or with almost empty cartridges the stoves may barely work at all. Warming the cartridge with your hands and insulating it from the ground can help to increase the heat output. Using a heat exchanger pot can make a difference too as more of the heat goes into the pot rather than the air. Of the upright gas stoves I've used the MSR Micro Rocket, Soto Micro Regulator, Optimus Crux Lite, Coleman Fi Lite and Primus Express Ti all work well and are very light weight. Slightly heavier is the MSR Superfly but it's worth considering for use in some European countries, as it's one of the few stoves that will work with Campingaz CV resealable cartridges as well as standard ones. Some years ago I used a Superfly on the GR20 in Corsica where CV cartridges were the only ones easily available. Heat exchanger stoves that come as units with pots are heavier but use much less fuel. Here I'd go for the Jetboil MiniMo for three-season use or the MSR Reactor or Windboiler for winter, especially snow melting. For larger pots and winter weather remote cartridge stoves are excellent. These have a lower profile than upright stoves and so are more stable. Because the cartridge is connected to the stove by a long hose it can be warmed more easily. More significantly as long as the stove has a preheat tube - a section of fuel pipe running through the burner - the cartridge can be inverted so that liquid fuel runs through the fuel line rather than gas which means the stove will work well in the cold. Some stoves such as the Optimus Vega come with fold-out legs to support an inverted cartridge. With other stoves the cartridge has to be lent against something or supported with tent pegs. Remote cartridge stoves weigh more than upright stoves but are still quite light. 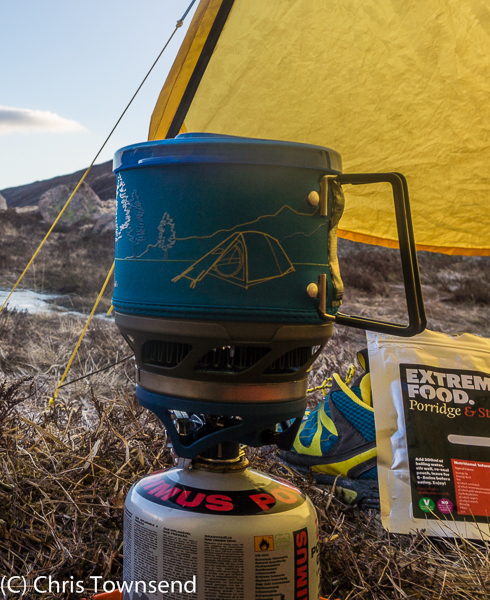 My choices would be the Optimus Vega, Primus Spider, MSR Whisperlite Universal, Alpkit Koro and, with heat exchanger pots, the Primus Eta Spider Stove Set and Primus Power. How much fuel is needed depends on how much the stove is used of course. I generally boil 2-4 litres of water a day and run a stove for 30-45 minutes. Used like this a 250 size cartridge lasts me three to four days with a standard stove and pot and six or seven days with a heat exchanger unit. 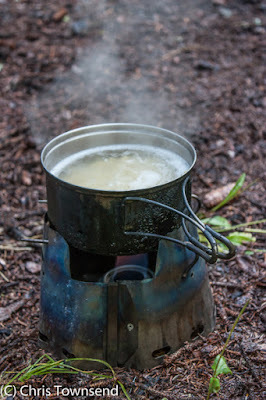 For long distance walks, especially in remote places, liquid fuel stoves running on white gas (purified petrol) such as Coleman Fuel, petrol or paraffin were standard a few decades ago. I used them on half a dozen multi-month walks. They were also good in sub-zero temperatures and for group cooking so I also used them when I led ski tours. Such stoves usually have pumps so pressure can be maintained as the fuel bottle empties so the heat output is constant even in the cold. Most stoves have remote fuel bottles that detach from the stove for carrying too. Good examples that I've used successfully are the Optimus Svea 123, Optimus Nova, MSR XGK EX, MSR Whisperlite Internationale and MSR Dragonfly. These stoves will run on white gas, unleaded petrol, paraffin and diesel so even in remote places some type of fuel should be available. The latest models will also run on butane/propane cartridges and it's one of these that I'd choose now because of the versatility. I'd mostly use it with cartridges too, only using liquid fuels if that's all I could get. I used to prefer liquid fuel for snow melting in winter but now I use a gas stove with inverted cartridge and heat exchanger pots. The Primus OmniLite Ti and MSR Whisperlite Universal are both good multi-fuel models that will run on cartridges. With liquid fuel stoves I find a litre of fuel lasts at least ten days. A big advantage of these stoves is that most are field-maintainable, unlike most gas stoves. That could be important on a long trip in a remote area. Unlike liquid fuels and butane/propane meths doesn't need to be pressurised for use in a stove. This means that stoves can be much simpler with no moving parts, so there's little to go wrong. Indeed, you can make your own meths burner out of old drinks cans. Meths is also a quiet fuel with none of the hiss or roar of pressurised fuels so you can hear the sounds of nature rather than the noise of the stove. However there are cons to meths as a fuel too. The main one is that it's not as efficient as pressurised fuels so more is needed. I find a litre lasts me 5-7 days which fits in with Trangia's claim that a litre of meths will boil twenty litres of water. As with all stoves some models are more fuel efficient than others. Also, the flame is just about invisible in bright light so care needs to be taken when checking to see if a stove is still lit or not . Don't add more fuel until you're sure it's out! I make sure by holding my hand a few feet above the stove and slowly lowering it to see if I can feel any heat. Simmering can be difficult with many meths burners too, though some do have crude simmer controls. Because meths isn't pressurised it has no wind resistance so a windscreen is essential in even a light breeze (I recommend a windscreen with any stove for fuel efficiency anyway). Meths is an easy fuel to find as I discovered on my last two long distance walks. Chemists and hardware stores usually stock it. It can be carried in ordinary lightweight plastic bottles too, unlike white gas and paraffin which need heavier special fuel bottles, which partly counters the extra weight of more fuel. Meths stoves can be used in freezing weather but they're slow for snow melting and most need refilling often as they don't hold much fuel. The classic meths stove, which has been around for over fifty years, is the Trangia. This comes in various configurations of windscreens and pots, all with a sturdy brass burner. Trangia units are tough and functional - this is a stove that will last a lifetime -but also quite heavy and bulky. For many years there were few alternatives to the Trangia. However the last few decades has seen a whole host of them appear, mostly in the form of burners made from drinks cans by small cottage industries. All of these are much lighter than a Trangia but only some are as functional. Of the ones I've tried my favourite by far is the Trail Designs Caldera Cone, which comes in an array of different sizes to match different pots. This combines a burner with a windscreen/pot support like the Trangia but at a much lower weight and size. I've used the Ti-Tri version, which is made from titanium, on two long distance walks and many shorter trips including the TGO Challenge. Blocks of solid fuel such as Esbit tablets are an alternative to meths. Tiny stands are available for solid fuel such as the Trail Designs GramCracker, which can be used inside a Caldera Cone. Solid fuel is lightweight and compact and of course can't be spilled. The flame is even less powerful than meths though and simmering is just about impossible. Even so it's a viable fuel for boiling water. The big advantage of wood as a fuel is that you don't need to carry it with you. The disadvantage is that finding dry wood in wet conditions can be difficult even in woods. In Britain combining wood with another fuel is wise. Many meths or solid fuel burners can be used with wood-burning stoves and some stoves are designed to use wood. The Trail Designs Ti-Tri can be used with wood, which I did frequently on the Pacific Northwest Trail but only twice on the rather wetter and much less wooded Scottish Watershed. 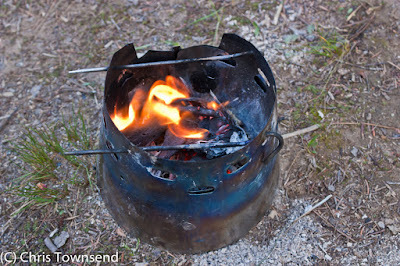 I used the Inferno insert with the Ti-Tri, which meant the twigs burnt to a fine ash and produced much heat. Other good wood burners I've used are the BushBuddy Ultra and the Backcountry Boiler. Meths burners can be used with both of them. Currently my first choice for long distance walks is the Trail Designs Caldera Ti-Tri as it's lightweight, windproof and durable (though you do need to protect the meths burner against crushing) with no moving parts to fail. It can also be used with solid fuel, meths and wood. For shorter trips in places where a stove failure wouldn't be a disaster I use a gas stove as these are so easy and convenient. I wouldn't take one on a long remote country solo trip though as they're not field maintainable and I have had failures (the weight of upright stoves is so low that a spare could easily be carried though). For winter use I like remote cartridge gas stoves with heat exchanger pots. I'd now only use a liquid fuel stove if going somewhere extremely cold or somewhere it was the only fuel available (I once led a ski tour in Greenland where we used jet fuel as that’s all we could get). Good post Chris and i couldn’t agree more. Off topic a little Chris but I love that photo of you in the Richardson Mountains. I think that's in the Backpackers Handbook but your Yukon book is short on pictures. 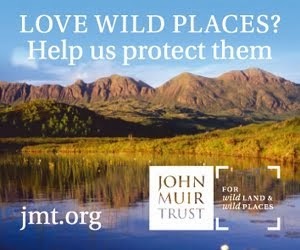 Do you have more anywhere else and were publishers at the time of your Yukon book less keen on photos as they are now (noting your recent two books)? 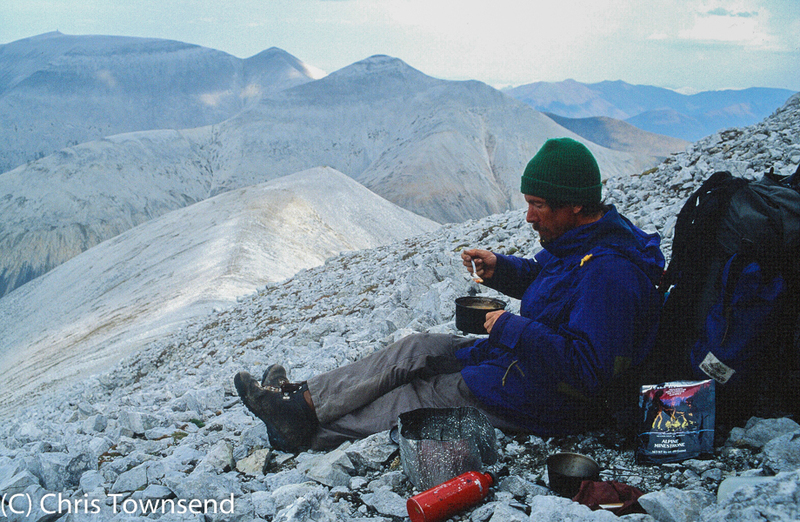 Mark, I recently had some of my Yukon slides scanned for TGO as I have a piece on that walk in the next issue. I'll post the other pictures (TGO will only use one) on my blog soon. 'Walking the Yukon' is the only one of my books without any pictures. I'm not sure why the publishers took it on as they never seemed keen on it and never did any promotion or marketing (this was long before the Internet of course. Unsurprisingly it sold very few copies and has long been out of print. That publisher, Ragged Mountain Press, doesn't exist any more. I would like to republish the Yukon book as an e-book with photos but I don't know how feasible that is. Thanks Chris. It's actually my favourite of yours and encouraged me to get out there, which I did. Good news about TGO and your blog. I'd love to get my hands on the Yukon book (sorry for going off topic too). I'm considering different stoves. I use gas, and here in the Pyrenees I use a MSR Superfly screw in gas stove for the compatibilty reasons you mentioned, although I've noticed more screw-on canisters are availible over her now. I have a Vargo Triad meths stove which weighs only 28g, but have used it only on a few trips so far. The thing that puts me off meths is that in inclement weather I want to cook in the porch of my tent, and meths just seems to be a dirtier fuel to manage than cartridge gas. I think that maybe a meths stove is more risky in a tent porch? (TN Laser Competition eg.). Any thoughts Chris? I know you like the Akto tent, but how was it like cooking with a meths stove in the porch? Did you just put it outside the tent and hope the windshield would be effective enough against bad weather? I too bought the Optimus Nova multi fuel stove, and dream of undertaking a remote trip Tibet eg. where I'm sure it will come into its own. But for my current trips, its unnecessarily cumbersome. But it is a fantastic piece of engineering. Jay, I've often cooked in the porch of my tent with a meths stove. I don't think they are any more dangerous than a gas stove. 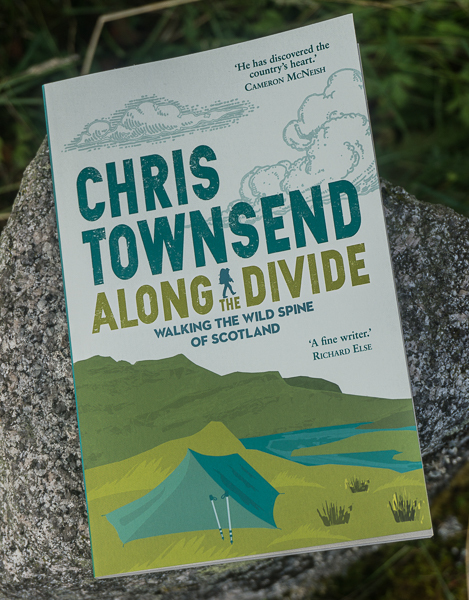 You can see a picture of a Ti-Tri inside my Trailstar here - http://www.christownsendoutdoors.com/2013/09/scottish-watershed-gear.html. White gas stoves are another matter. I've used those in a tent porch - very, very carefully! And always lit them outside first as they are likely to flare when primed. The Nova is a superb stove. I haven't been anywhere I've needed mine for many years though. I hope you get to Tibet. Thanks Chris. I always use a fire steel to light gas stoves as I think they're more reliable than BIC lighters or matches (I've had waterproof matches fail on me when they were damp. I know, I shouldn't have let them get damp in the first place!). But with the Nova, when you were in Greenland, what method did you use to pre-heat the stove? My Nova is in a storage unit currently so its a bit tricky to access to experiment with it. I haven't tried lighting it with a firesteel. I too am hoping to go to Greenland next year and maybe the Nova would be my best choice of stove? Or maybe I should go the meths route with the Vargo Triad? I've only ever used the Mova with white gas/petrol so that's what I used to prime it. Other multi-fuel stoves I've used with paraffin and diesel had wicks to soak up the fuel for priming so again I used the same fuel. Don't know if you've come across this? "Watch Benzin Benzinkocher Enders Baby Nr. 9063" on YouTube "
For years I used the legendary MSR Whisperlite International normally with locally bought unleaded petrol. It was the perfect stove on foreign trips where gas cartridges cannot be found. With fewer overseas trips these days I now use a remote gas stove (currently the Optimus Vega) But, I have experienced some problems when, after lots of use, the screw thread wouldn't attach to gas cartridges properly (MSR Wind Pro and Pocket Rocket.) Thanks to your articles Chris, this summer I used a Trail Designs Caldera Cone as a wood burner - what a revelation. Absolutely brilliant when camping in/near the forest. Sitting by the wood stove feeding in small twigs is mesmeric. Camping iss an awesome approach to make tracks in an opposite direction from your tiring every day plan and invest some fun energy with loved ones. Individuals are progressively getting inspired by outdoors relaxes and in this way make a trip outlandish spots to appreciate camping. Here are a couple tips and traps that can make your outdoors occasion a win. 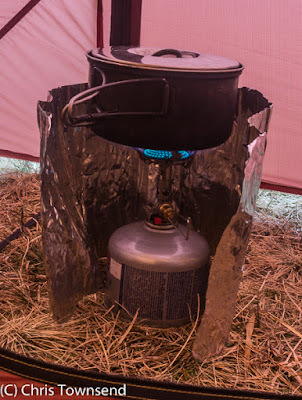 These type of stove is so easy to make it, and it is so suitable for camping....I can boil hot water for coffee and cooking whenever i want....thanks !!!! Propane:butane is insufficient information about a cold-weather gas-mixture intended for a canister-top gas-stove. Iso-butane is a gas to -12C, but butane-n a gas to only -1C. A good gas-mixture for a canister-top stove in cold weather is propane:iso-butane with no butane-n. The more propane, the better - that remains a gas on its own to -42C. Mixing gases does reduce overall performance but some propane:iso-butane mixes are still claimed as good to below -20C - perhaps only true with a new canister, but it is impressive. In a canister-top stove the more volatile propane gets used up first so performance will drop over life of the fuel but propane:iso-butane is still much better than a propane:butane-n mix in the cold. I find the Kovea Spider a reliable remote-canister gas-stove - light, reasonably compact, pre-heat tube so liquid-gas feed is possible in very cold weather. 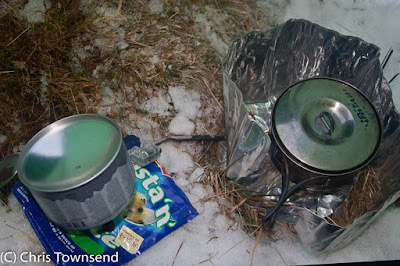 That said, year-round go-to stove instinct is for a home-made meths effort - it has pre-heater so works fast every time. For old-times sake I might drag out my 1985 brown Coleman Model 400A Peak 1 white-gas stove - heavy, bulky, but superb output control and will cook dinner for a week on one tank of fuel. Thanks Chris Townsend for sharing your experience. Normally i use butane lighter in that situation and it works for me.